When I asked for ideas for playthings for Isis, Kerry suggested packing a kong with smooth peanut butter. But when I go to my local shop today they only have the crunchy variety. Inanely, I buy a jar of Marmite instead. I smear it inside the kong and sure enough Isis spends a happy twenty minutes slurping it out. But, as Polymath reminds me, Marmite is very salty and probably very bad for dogs. I’d better throw it into something I cook. Must put ‘smooth peanut butter’ on my shopping list. My nice metal waste-paper basket can no longer be employed for its intended purpose since Isis empties it onto the floor. Instead I have been dropping into it selected items which I think she might like to ‘steal’. When I begin this post, the basket is full of interesting things: a small Lucozade bottle, a sheet of cellophane, plastic bottle tops, a cereal box and different sized strips of paper. I reach for my camera but I am too late. Most of the contents are now strewn across the floor and Isis is in her bed doing battle with the cereal box. The image below was taken in the summer. The grunting pig belonged to El. Isis did not appear to know about playing. 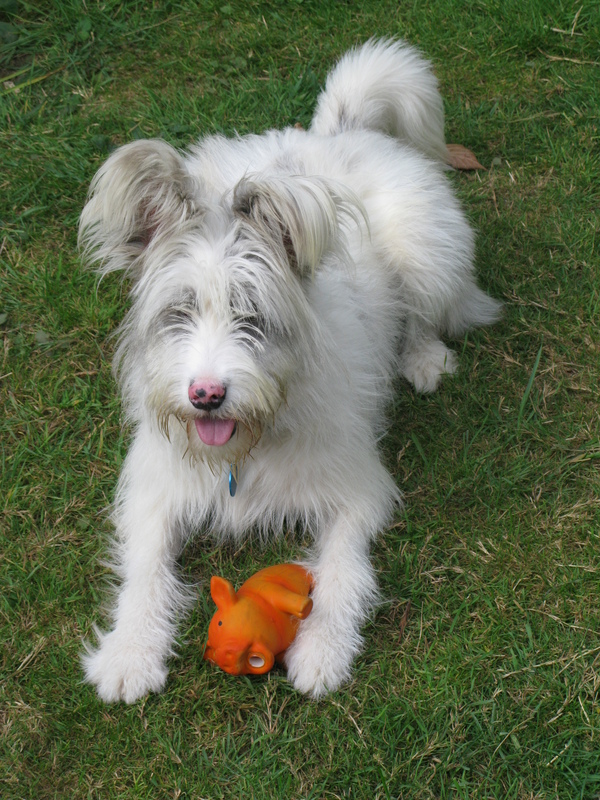 When I offered her the pig – or any other toy – to sniff and waggled it around she simply took it from me and dropped it. But this evening, I give her the pig, retrieve it, make it grunt and so on, and she takes it from me and plays with it on her own for several minutes. She does this twice. A real breakthrough. I wonder whether she can hear the grunt (she hears a few low sounds) or feel the expelled air on her face. Whichever, it seems we may be learning how to play! And now she has three proven playthings: a kong, a bin and a pig. This entry was posted in deaf/blind dog, deaf/blind dog plays and tagged a toy for deaf/blind dogs, blind dog plays with pig, deaf/blind dog plays. Bookmark the permalink. We always thought Isis had some hearing. Might I suggest one of those supposed indestructible rubber toys with a bell or a squeak inside it. Maybe Isis never had the chance to be a puppy and to do the things that puppies do. Best to you and Isis. Garry. Hi Garry. Thanks for the suggestion. I’ll try her out with some of the squeaky toys which El used to play with. I think you’re right that she is being the puppy she didn’t have the chance to be before.